Following the advice of the guide books, I was at Gates of the Valley (Valley View) a couple of hours before sunset to get one of the very few prime spots available. I had one camera on a tripod to take in the classic scene before me. I had another camera ready to go with a telephoto lens attached. 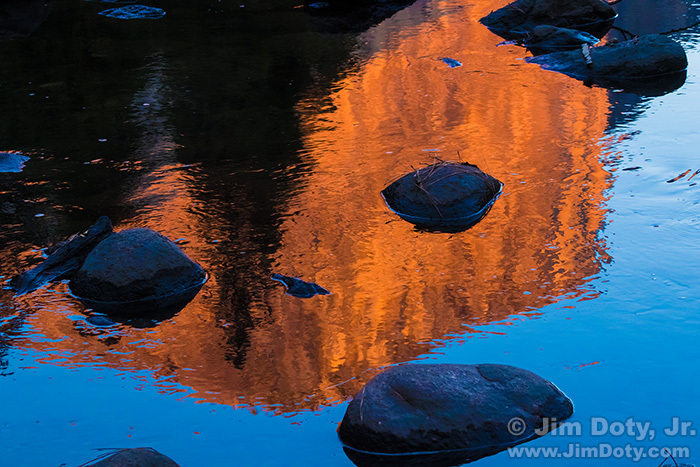 As the light turned warm I noticed the reflection of El Capitan in the Merced River. I loved the warm rock face against the blue water. I walked around on the boulders to find just the right spot so the upside down top edge of El Capitan was not significantly broken up by a large boulder. It was hard to do with so many boulders in the river. I finally found the best spot possible, steadied myself as best I could for the hand held shot with a long lens, and gently squeezed the shutter. The image stabilization in the lens helped me get the shot. It is my favorite image for October 25. Gates of the Valley (Valley View). El Capitan, Cathedral Rocks, Merced River. Yosemite National Park, California. October 25, 2015. I did get several photos of the justly famous Valley View. Stars Over El Capitan, Yosemite National Park, California. October 25, 2015. Click for a larger image. 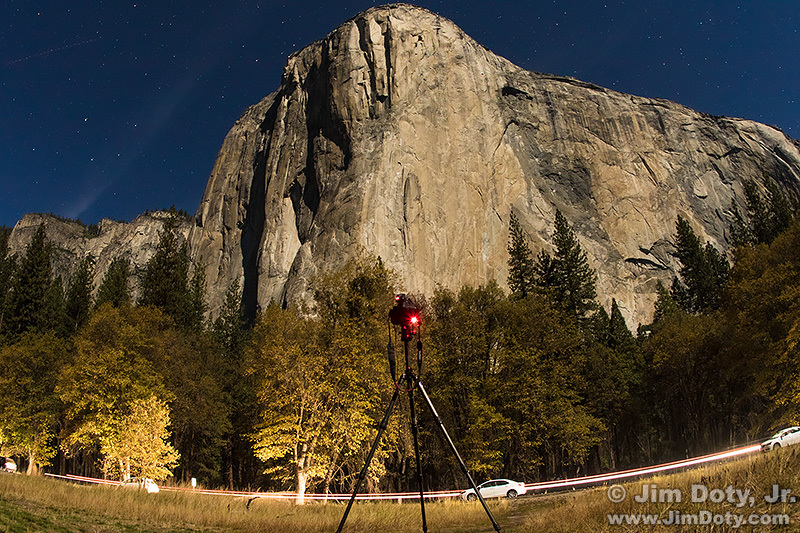 One of my missions for this short (24 hour) trip to Yosemite was to do some night photography. I set up in in the meadow opposite El Capitan and began taking back-to-back exposures, each approximately five minutes long. There is one gap when a plane flew over and I didn’t want airplane lights in my image. I stacked 8 images to create this photograph. This is my second place favorite image for this date. 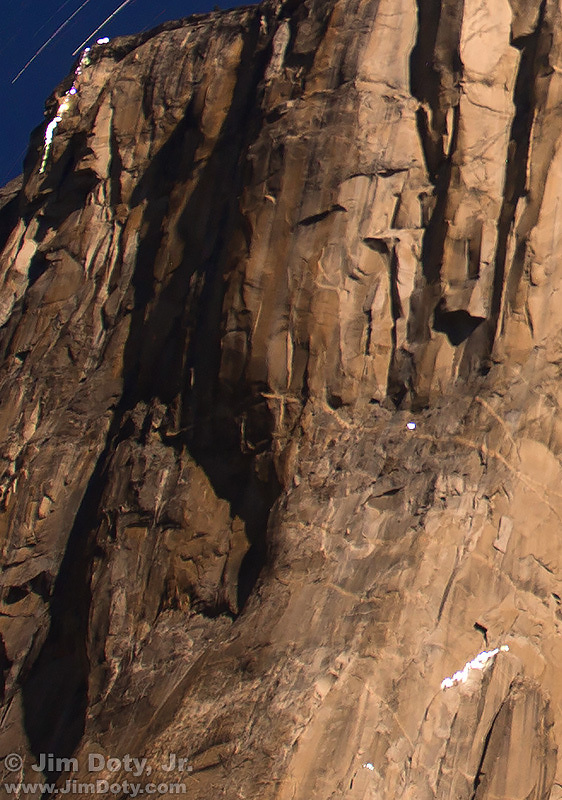 If you look closely you can see lights on El Capitan from climbers on the rock face. 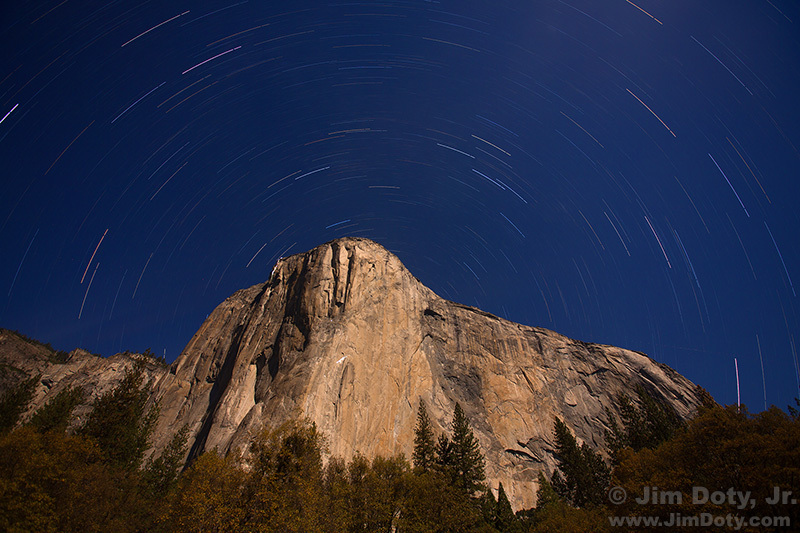 Cropped from Stars Over El Capitan, Yosemite National Park, California. October 25, 2015. This is cropped from the top image so you can better see the lights from some of the climbers. Two groups of climbers made significant progress. The ones at the upper left topped out. There are also two lights from climbers who have stopped for the night. One group (center right) has stopped a ways below “The Great Roof”. El Capitan, camera and tripod. El Capitan Meadow, Yosemite Valley, California. October 25, 2015. Click for a larger image. With a second camera I took a picture of the first camera in the middle of one of the five minute exposures. The red light on the bottom right corner of the camera tells me the shutter is open. The other red light is on the GPS unit on top of the camera. Three young women visiting. Cathedral Rocks, Yosemite Valley, California. October 25, 2015. While I was taking pictures, three young women walked up to ask what I was doing. They knew I was taking pictures of course. They wanted to know how I was able to take pictures in the low light. After a brief explanation (tripod, high ISOs, 30 second exposures), they walked across the meadow and stopped to enjoy the view. It was fine with me that they were in the scene I was photographing. 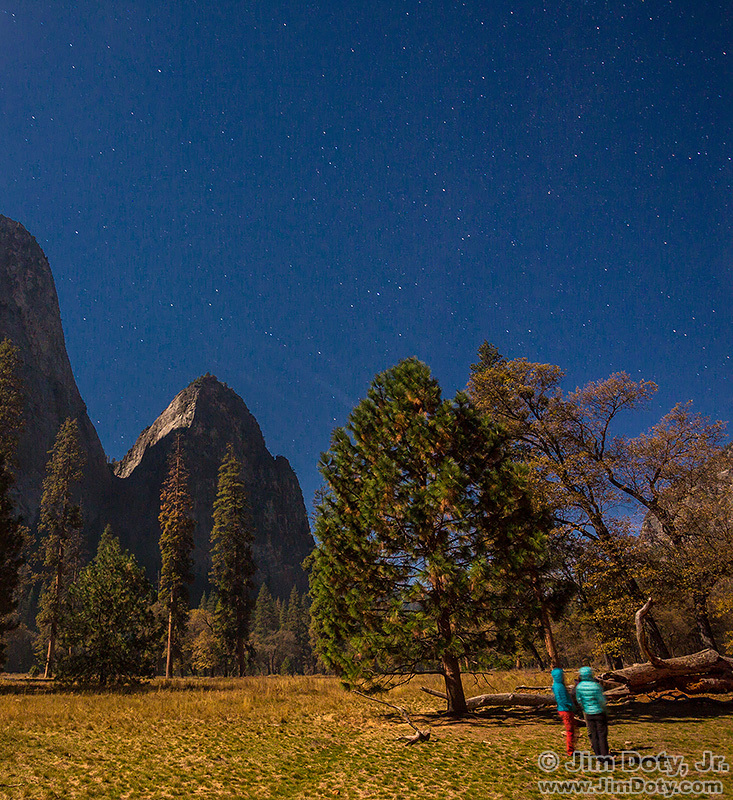 Yosemite Valley at Night. Eagle Peak, Yosemite Point, and North Dome. Yosemite National Park, California. October 25, 2015. Click for a larger image. I moved on to new location and ended up with my third favorite photo for this date. This panoramic image was created by stitching together five overlapping images to create a final image a little wide than 180 degrees. A plane entered the scene, heading west to east, creating the vertical line of light. 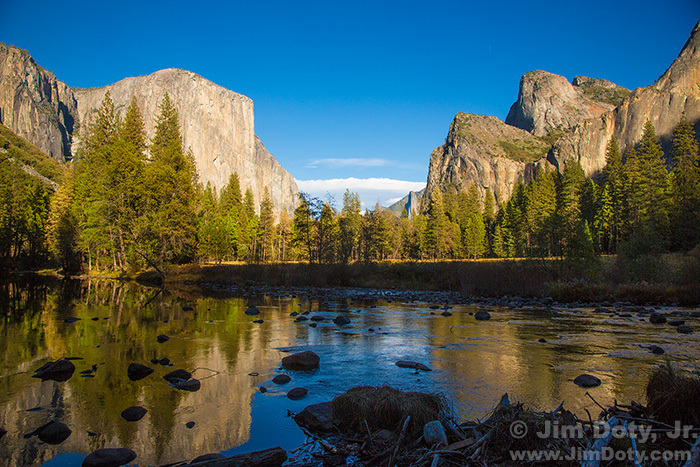 If you have not been to Yosemite National Park, and especially Yosemite Valley, you simple must go there. It is one of the most spectacular places on the planet. I recommend going in the fall (late October, more or less). You will avoid the huge crowds that are there in the summer. Sarah, Columbus, Ohio. October 25, 2014. Ok, this is a big change of pace from Yosemite. I was working with a professional fitness trainer to create a series of images for her web site, plus some images for her own personal collection. We have done several photo shoots together. This is my fourth favorite image for this date. If you have been following this series for a while, she might look familiar. She is my favorite image of the day for October 16. “Deer in the Headlights”, Yosemite Valley, Yosemite National Park, California. October 25, 2015. I threw this in just for fun. 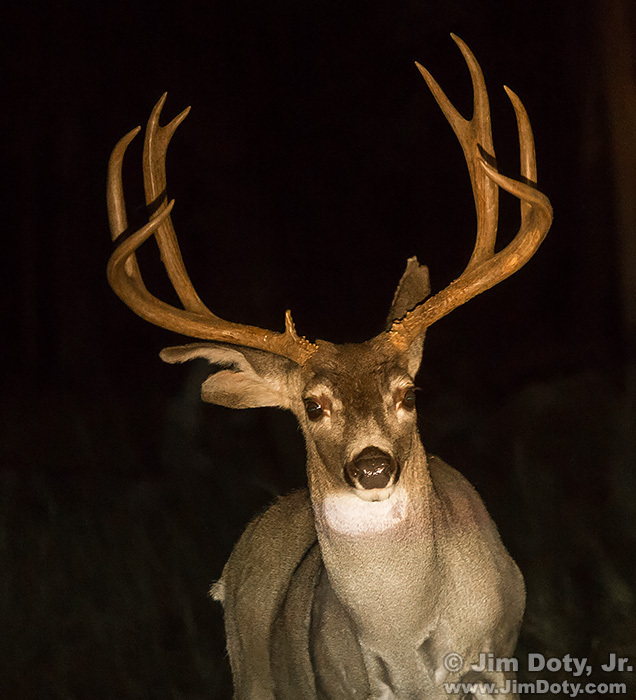 As I was driving around at night looking for photo locations, this buck was standing by the road. I stopped and took a picture through my front windshield. He stood there. I gently opened the car door, got out, leaned against the car door and took more pictures. He stood there, literally a deer in the headlights.